By Divya Wodon and Naina Wodon, Interact Club of Washington International School, and Quentin Wodon, Rotary Club of Washington, Washington D.C., USA, and the TRF Cadre of Technical Advisors. 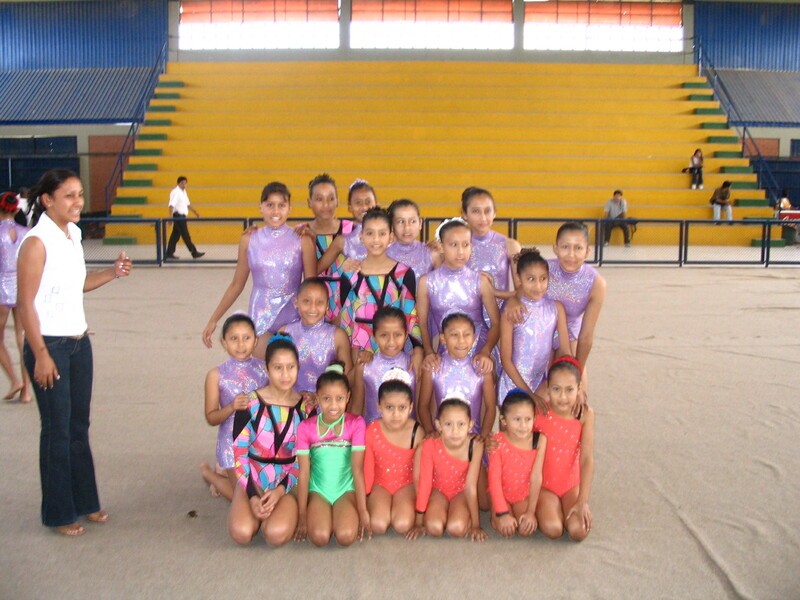 The young Bolivian gymnasts and their coach. Maria Nelly Pavisich has been a Rotarian for more than two decades. She has led international projects including a new $151,500 global grant approved by The Rotary Foundation a few weeks ago. But when we asked her what she remembers most fondly from her Rotary years, she told us the story of young girls from her native Bolivia who went on a journey from poverty to winning a national rhythmic gymnastics competition. One day a friend told Maria Nelly she had to see a gymnastics project-school run by a Spanish volunteer and former gymnast in one of the poorest part of the Bolivian city in which she then lived. The “school” consisted only of a patio with a hard floor surface surrounded by a grass garden used for training. How could the girls perform crazy stunts with no mattress! What would happen if a girl fell and broke her bones? Maria Nelly persuaded her club to raise funds to buy proper gymnastics equipment. They raised US$10,000 from Rotarians in Bolivia and the US. The school grew and a few years later the girls won Bolivia’s rhythmic gymnastics competition three years in a row. When we asked Maria Nelly what was most rewarding in this project, she told us that watching these young girls bloom into confident young women was amazing. The first time the girls won the nationals, they were so surprised and shy that they kept their face down. Their teacher Cristina had to tip all of their chins for them to look up. The second time they won, they watched the crowd and smiled radiantly with confidence. If you visit Maria Nelly at her home, you will see pieces of art ranging from a Senegal butterfly wing collage to a painting by her daughter Daniella depicting Buddhism, Hinduism, Judaism and Christianity together in harmony. Maria Nelly’s conviction is that everybody should be valued and that every Rotarian has something to offer. We just need to help people open up and give, whether this is money for gymnastics equipment, or a truckload of soybeans as done by a farmer Rotarian to help provide nutritious meals for the young gymnasts, their siblings, and their families. What is the membership challenge faced by clubs? Who are their members, and how satisfied are they with their club experience? How can areas for growth be identified? How can clubs innovate to attract and retain members? How much service work do clubs engage in? What types of work do they do, and what makes projects successful? And finally, how can district conferences be more engaging? If you read the book, available from Macmillan, let us know what you thought about it. If you would like to get advice on how to conduct similar research in your district, let us know as we would be happy to help. You can contact us at wqtjj@yahoo.com.